“I suppose I shall never again know such happy hours as those I spent at Wylde Green before the war, watching the horses at work on that raised plateau. To the left the farmhouse built in Shakespeare’s time, to the right and below one, the rich Warwickshire plain.” So wrote the diarist James Agate of his visits to the “Stud Farm at Wylde Green, where his friend the farmer Mr. Albert Throup bred horses. Agate had been dead ten years when the Stud Farm was sold and demolished in 1957, and its 50 acres sold to a developer. The farm had once been much larger - when the farm came up for auction at the Three Tuns Inn in Sutton in 1790, the sales catalogue described it. It consisted of an “ancient mansion”, various outbuildings, a large orchard and 164 acres of land, including a stone quarry marl pits and clay for brickmaking, in “a fine sporting country, abounding with game, commanding many delightful and extensive views”. Some of the fields were on the other side of Birmingham Road where Station Road is now, but the main part of the farm lay to the south, extending as far as Penns Lake. The ancient farmland in Sutton, dating from before the Norman Conquest, was arranged in open fields; Maney’s open fields extended as far as Wylde Green Road. The open country to the south of Wylde Green Road was brought into cultivation in the twelfth or thirteenth century as the market for agricultural products grew. The neighbouring 160-acre farm at New Shipton was laid out by the Lord of the Manor, the Earl of Warwick, while enterprising local men could “assart” the land which became Wylde Green Farm with the lord’s permission. Raphael had already served as a juror and a tithingman for the “Maney and the Wild” quarter of Sutton, but held higher positions after he inherited - Affeerer in 1577, Constable in 1578, and Warden 1588-9. He died in 1616, succeeded in turn by his son Raphael. This Raphael was Warden in 1635, and it was probably his son, another Raphael who was Warden in 1658 and 1667. He died childless in 1675, and one of his thirteen nieces and nephews inherited - in 1742 Mr. Henry Sedgewick paid the chief rent for “Wylde Green and the appurtenances” - three shillings and eightpence, exactly the same as an earlier Henry was paying two hundred years before. (Article based on research by the late Alan Howells). 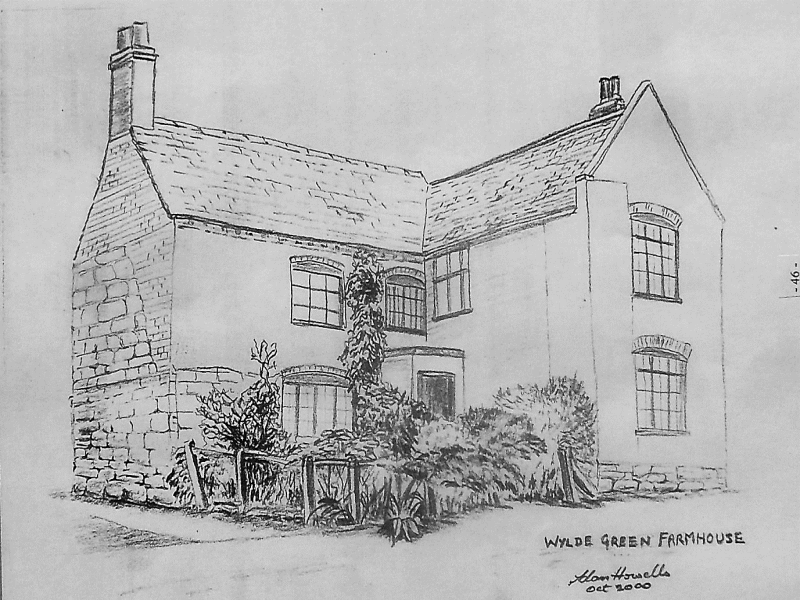 Drawing of the farmhouse by Alan Howells, based on an old photograph and recollections of elderly residents in 2000 - the house was said to have the date 1639 carved inside. The house stood back from Wylde Green Road, near Kempson Avenue.